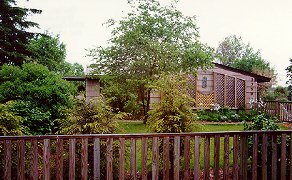 This contemporary ranch homestay has provided quiet comfort to business and pleasure travelers since 1986. Minutes from downtown, the Urban Retreat is located on a quiet, tree-lined street, with adjacent parkland offering walking trails. Two guest rooms and common areas are lovingly furnished with antiques from the owners' private collection. Breakfast is served on the year-round porch overlooking the gardens, with menus varying daily. Special diets are accommodated with advance notice. The Urban Retreat has been designated a Backyard Wildlife Habitat by the National Wildlife Federation, and welcomes guests from all cultures, races and lifestyles. Rates: Two rooms (l PB, 1 SB). Double occupancy $60-$75 per night. Central air. Resident cats. Restricted smoking. Inspected and approved. Visa/MC/Personal checks accepted. By reservation only. This and other Ann Arbor Bed and Breakfast Inns can be found here in The Register.